There really is no other way to say it: Man Man is a weird band. Their records are a soundtrack to your daydreams and nightmares. They paint their face making their shows more like a circus. You’ll fall so hard for their music, and there’s no way to even explain it. They tie you up and hold you hostage. Chaotic, complex and twisted, they are Man Man. See them live and you’ll see the spectrum in the crowd – punks with patches on their denim and hippies with flowing skirts. Their music is experimental: tight and loose at the same time. Man Man loves people of dissonance, people who like the Fender Rhodes in the front and people who like eccentric, curious and honest songwriting. And, we the people, love Man Man. This Philadelphia band has been around just shy of a decade. On Oni Pond is the band’s fifth record and their third on ANTI-. Lead singer, on piano, Rhodes Piano and songwriting mastermind, Honus Honus (Ryan Kattner) leads his band: Organ Freeman, Chang Wang, Critter Cat and the band’s long-time drummer, Pow Pow (Christopher Powell). Usually writing alone, Honus wrote On Oni Pond with Pow Pow and producer Mike Mogis. And it shows. The record’s natural state is percussive, moving in every way possible: sideways, up and down, telling lateral stories, sometimes moving backwards and of course, in loop-de-loops. 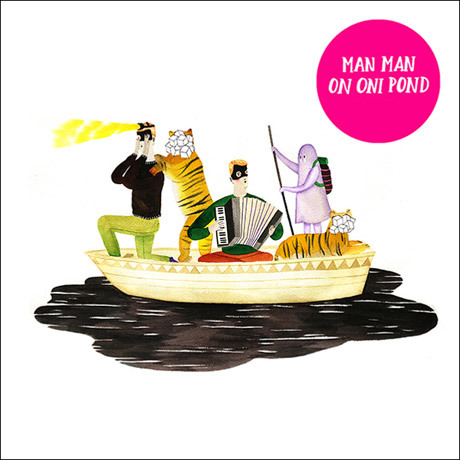 A separate entity, almost entirely, from rock music, Man Man is in a class of their own and On Oni Pond is proof. Man Man will yell at you to follow your dreams, they’ll tell you to be who you want to be, to be sure of yourself. They’ll remind you that “If you wont reinvent yourself/You cant circumvent yourself.” And it’s as simple as that. On Oni Pond swallows you up, spits you out and sets you free. Just the way Honus would’ve wanted it. They are introspective and innovative. Man Man has made it into a Life Fantastic. And lucky us, it just keeps getting better.